Microsoft has launched a new Outlook app for iOS and Android powered phones and tablets and a preview version of Outlook has been launched on Android’s Google Play Store. The new app is based on the application Acompli, Microsoft acquired for $200 million last year. The new Microsoft Outlook app will support Office 365, Outlook.com, Yahoo Mail, Gmail and many other service providers. 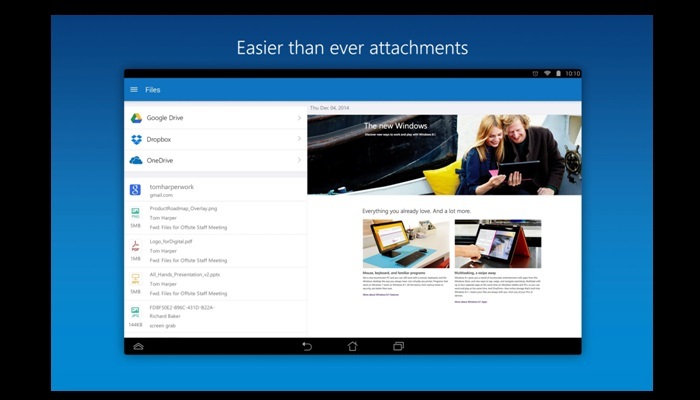 The new features include the ability to send attachments through various cloud services, including but not limited to Microsoft’s OneDrive and Dropbox. Swipe gestures are now supported to help the users feel more comfortable in tablet and phablet department. The new app is expected to slowly replace current range of Microsoft Outlook apps, like Outlook.com for Android, and Outlook Web Access apps for Android and iOS (available only for paid subscribers of Office 365) which is a rather limited on features part. The aforementioned apps will still be available, for now, so as to allow the users a smooth transition to the new app. The company itself recommends that Outlook.com users should switch to the new Outlook app. 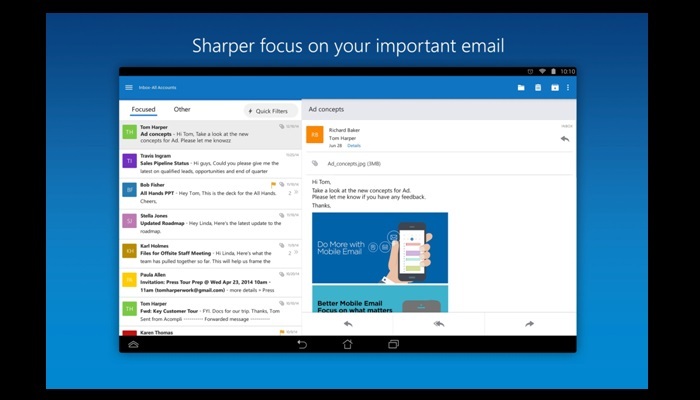 Newer version of Microsoft Outlook apps are based on the acquired technology from the email app Acompli. Infact, most of its look and feel is derived from the original Acompli apps. Although, Microsoft has added some of its own MS-Office touches to the app like a colored ribbon-like UI. Julia White, General Manager of Office Division, Quoted as saying “We brought that team in and now it’s a core part of the Outlook team”. Presently, only the iOS version has been launched officially, the android version is still in a preview stage. This difference arises from the fact that the android user base consists of a large hardware ecosystem and Microsoft wants to generate some more data to provide its android users, an experience similar to its iOS users. Android version may be launched in a couple of months. The fact that Microsoft Outlook apps relaunched under the moniker of it’s own Outlook shows how great the original Acompli apps were; and that Microsoft has set its eyes on the mobile platforms. The launch also indicates that Microsoft is ready to compete without separating itself from other service providers, as it did with most of its services in the past.